(Excerpt after my DYNASTY 0 page. * Preliminary note: For some years (late 1990s - early 2000s) most of the Egyptologists have accepted the status of a Kings Scorpion (I) as the owner of the Abydos tomb U-j, after G. Dreyer's remarkable publication (1998) of this invaluable and much publicised discovery (Naqada IIIA1/IIIa2). This king was also tentatively identified with the victorious ruler depicted in the Gebel Tjauti graffito, where a falcon and a scorpion are incised though not directly related with the ruler's representation (i.e. not carved directly above the sovereign figure, but on the opposite side of the panel). Consequently, the already known and later king Scorpion (Naqada IIIB/C1), to whom the present page is dedicated, has been distinguished naming him "Scorpion II", in order to avoid confusion with the earlier homonymous king. However, more recently, some scholars have raised objections to the reading of the tomb U-j inscribed materials (incised ivory tags, painted marks on wine jars) as personal (royal-) names**, proposing a more likely interpretation of the scorpion signs and other hieroglyphs as place-names (indicating the localities where gravegoods were delivered from/to, in the case of the U-j tomb attestations). In the lack of a "king Scorpion I", it thus seems that also the designation of "Scorpion II", commonly adopted in the last five years, could be quite easily abandoned. **[Cf. Table 1 in "Dynasty00" for a similar criticism to the interpretations of the graffiti on the Koptos Colossi]. King SCORPION is known by a single inscribed ceremonial object (although a few more have been tentatively ascribed to him, as I'm illustrating below). Style, epigraphy, provenance and typology of this document clearly indicate a datation within the period of the last reigns of Abydos' Dynasty 0: not much earlier than Horus Ka and certainly not later than Narmer's age. In the lack of his tomb at Abydos, he might be thought to represent a local 'Gegenkönig' (as Dreyer defines Horus Crocodile for the Fayum area); these sovereigns were possibly the last expressions of ancient local indipendent ruling lineages which ceased to exist when the powerful kings of the Thinite region moved northward and southward to occupy the territories with which, until then, they seem to have entertained mostly peaceful, commercial relations. This increased their power making them responsible for the political Unification of Egypt. The status of king Scorpion at Hierakonpolis is hard to explain and Dreyer thinks this was a Thinite ruler whose Abydene tomb has not yet been discovered (but see below). Indeed the different writing of his royal name and titulary (rosette plus name instead of name within the serekh) and the provenance of his macehead from the "Main Deposit" of Nekhen do not necessarily indicate a Hierakonpolite origin for Scorpion: Iry Hor had an unusual royal name designation too, and so did Narmer (in some of his Horus name variations) who is similarly known by different finds from the temple of Nekhen. The discrepancies in royal titularies witness the slightly different traditions subsisting in the various local polities and a early stage in the development of (quasi-)divine kingship ideology. Despite the lack of predynastic king lists (and of their archaic rough equivalents, as are multiple royal names' stone vessels inscriptions and "necropolis sealings"; but for a possible exception cf. the conclusions) the Abydos late Dynasty 0 line (monarchs buried in the cemetery B) appears quite defined. It is obviously possible that new royal names might emerge or that those of kings known for discoveries in Lower Egypt or elsewhere might be found in the cemetery B of Abydos as well. Yet it is far less verisimilar to suppose that this could happen with a late Dynasty 0 (i.e. late Naqada IIIB) king as Scorpion, (unless we admit that scanty evidence might reflect an ephemeral, short reign). Iry-Hor, Horus Ka and Horus Narmer are fairly well attested royal names, not only at Abydos (see this serekh list). On the other hand the kind of attestations from Hierakonpolis élite cemeteries (loc. 6) is noteworthy different from the Abydene one (e.g. the use of sealings and the amount of their remains from the richest tombs of the two regions). It still seems possible to me that Scorpion was a roughly contemporary of Hor-Ka, and that the former ruled in the region of Nekhen (but cf. conclusions). The giant Scorpion macehead from Hierakonpolis (it's larger than Narmer's one) is a masterpiece of the period; for this reason (as well as for its being virtually the only object surely attributable to this king, and for the debates on the ritual it depicts and some further reasons, cf. below) this important artefact is fairly well known in Egyptology and there is no need to add a detailed description here. I only remark again that the name of this king is not written within the serekh and is not surmounted by Horus; the expression for 'sovereign' is rendered by the 'Rosette' . K. Cialowicz thinks that, at the right end of the rows of Rekhyt-bows standards, in the upper registers, there would be the standing king Scorpion represented (at higher scale) with the Red Crown of Lower Egypt on his head (cfr. 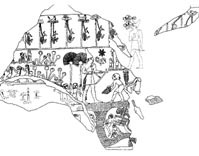 Adams - Cialowicz, Protodynastic Egypt, 1997, 8, fig.1 = line drawing below, left). For an alternative reconstruction by Midant-Reynes and Gautier (who suggest a second Royal Macehead might have been part of Scorpion's one) cf. below. For the Scorpion macehead (Oxford, Ashmolean Mus., E3632) cf. the bibliography. For more contemporary carved objects see my page here. Another "Royal" macehead from the same cachette at Hierakonpolis (UC, London 14898), even more fragmentary than the Scorpion's one, shows a king sitting under a canopy, wearing the Heb Sed robe and red crown; Arkell interpreted a slightly visible sign before the king's head as a Scorpion ; Adams (1974) found no trace of the rosette in a break in front of the red crown curl; therefore the object could have even belonged to another king of the period immediately preceeding Narmer: I would suggest that the fragmentary glyph might be perhaps interpreted as a standard with a crocodile whose tail is hanging down on the right (Horus Crocodile?). Cialowicz has offered a convincing reconstruction of the scene as the Sed celebration after a military victory of Scorpion (or Narmer); to the right of the sitting king, in the centre of the scene, there is a large falcon (turned towards the king) holding in its claws a rope which directs to the right-end of the preserved fragment. Behind the falcon and in a lower position, appear a number of prisoners (one ear is clearly visible) held with the rope by the falcon god Horus, who gathers (?) them in front of the ruler. 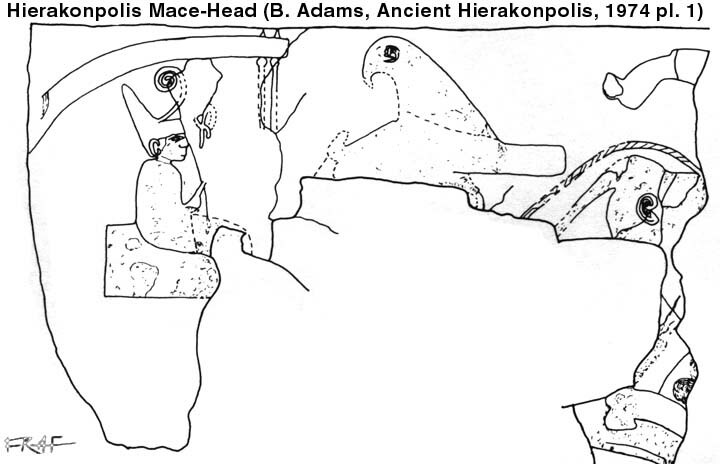 The scene of this mace is reconstructed by Midant-Reynes and Gautier (1995, fig. 15) as forming a portion on the right hand of the major extant relief of the Scorpion macehead in Oxford (cf. above). The canopy with the sitting king is hypothesised as being placed in front of the dancers and repwt (repit) processions; the 'recumbent' falcon, which in the other reconstructions of the Royal macehead faces the sitting king, would have to be placed, according to them, behind the king's Heb Sed pavillion, facing the two standard bearers who are represented on the right of Scorpion's name. A graffito at Gebel Sheikh Suleiman  in Upper Nubia, shows a scorpion with a prisoner into its claws; two more human figures, with a bow and false tails, are turned towards the captive and the scorpion. This scene should, in my opinion, be far earlier than Scorpion II, whose period it has been also referred to: it could be nonetheless related to a chief, but I would tentatively suggest a date in the Naqada IIIa (or even late Naqada II) period rather than a later one. The date is far more certain for a pair of limestone vessels from Quibell's Hierakonpolis excavations (id., Hierakonpolis I, 7-8) but, contrarily to the opinion of the publisher (ibid. ), the reliefs of falcons (Andjety / Nemty), scorpions, and bows + rekhyt birds surrounding the body of one of these stone vases (op. it., XIX,1 , XXV, photo below) can't be attached with any confidence to a "Dyn 0 ... Horus Scorpion" as neither can the isolated scorpion on the other vessel (op. cit., XVII,1 , XXXIII, 1). A larger group of objects has been assigned to this king by P. Kaplony, with alternate degrees of confidence: but it can't be really assumed that almost any known late predynastic representation of scorpions ought to refer to him or to other predynastic Scorpion kings . If not to be connected to otherwise unattested Serkit / Selkit or Djaret (female !) gods (but cf. LÄ V, 987-990 and Hendrickx et al., op. cit. in note 31), the scorpion may represent a toponym, as is the case for the painted marks on jars and the incided tags from the older tomb U-j in Abydos (these inscriptioins, as I have summarized in the premise, had lead Dreyer to identify a King Scorpion I as the owner of that tomb). It is noteworthy that the Main Deposit of Hierakonpolis even produced a number of alabaster offering dishes with incised hieroglyphs of scorpion (falcon in one case) + reversed ka-arms and scorpion figurines similar to those portraying various animals/objects found in some early cachettes (Tell Ibrahim Awad, Abydos, Elephantine). The tomb of Scorpion (II) has never been found; G. Dreyer and M. Hoffman have speculatively proposed it might have been respectively the four chambers Abydos tomb B50 and the Hierakonpolis cemetery in locality 6, tomb 1 . The slight traces of king Scorpion hinder any safe reconstruction about the place of origin of this obscure sovereign, the location and extent of his territory and the role he'd played in Late Predynastic Egyptian history. In the light of the recent trend to interpret royal representations on ceremonial objects at standardized, symbolic, ritual scenes (i.e. neither chronicles nor even commemorations of real events! ), little could be deduced from the analysis of the macehead (but cf. the conclusions). A royal name within a falcon topped serekh incised on a jar from tomb 160.1 at Minshat Abu Omar has been alternatively read as Aha and Scorpion. The sign does look like a scorpion, curved with both the tail (which is drawn above the body) and the head looking rightward, whereas the falcon looks towards the left. Van den Brink has proposed that this sign might be an upset variant of the coil identified by Dreyer on two vessels and a seal impression from Tarkhan (cfr. below) . For the possible datation (proposed by G. Dreyer, in Umm el-Qaab I, 1998, 173ff.) of the Tehenu palette (or Towns palette) to the reign of King Scorpion (II) cf. Dynasty 00 page. Also L.D. Morentz has recently (2004, 144ff.) reaffirmed the connection of the "Buto Palette" with king Scorpion. As it has been already anticipated, the existence of the Late Predynastic king Scorpion is clearly shown by only one powerfact, his decorated macehead. 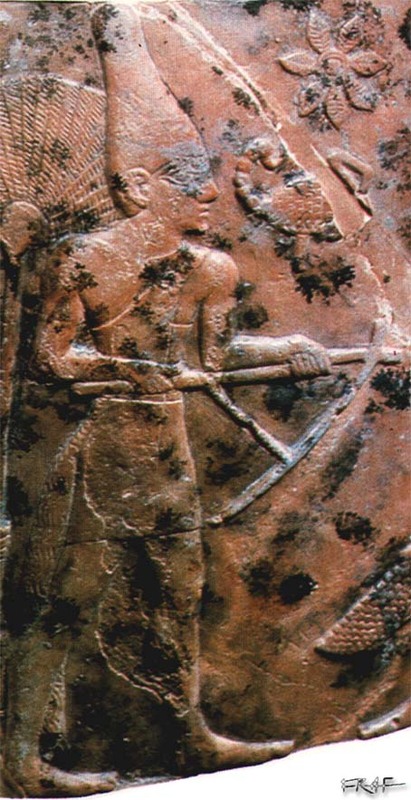 The royal figure has been also much debated: the king's name has been regarded as an indication of a different ruling line (Hierakonpolis) in which the rosette would have a similar meaning as the Thinite serekh. Notwithstanding the possibly different origin and controlled territory, it has been often evidenced that the general relief style and details in human protraiture would seem to make the Hierakonpolis mace-heads very close in time with each others, if not the work of the same hand (Baumgartel). On the other hand some authors have simply denied the existence of a Scorpion king, eventually equating him with Narmer (Vikentiev 1950; Baumgartel 1960; Malek, 1986; Menu, 1996; Lankester 2011) on the base of the too close analogy of artistic canons and style of the reliefs on his macehead when compared to those on Narmer macehead and palette and above all by virtue of the assumption that rosette + scorpion emblem would be a mere additional title, attribute or appellation of Horus Narmer rather than a different iconographic device to display royal titularies (thus dismissing the possibility that there might still have been at that time more than one system to identify late Naqada IIIB rulers, other than with serekhs. This is in my opinion very unlikely, if not wrong at all). Even strictly considering the unique certain source, which is evidently the most important one, some interesting conclusions can be attempted about the status of the individual in object and the political outline at the end of Naqada IIIB period (c. 3100C). We must assume that what is left on the mace-head reliefs has at least a minimum relationship with the actual geo-political situation of that time. I mean that even if not necessarily a narration of historical circumstances, or even less extremely a mere commemoration of (past?) events, the representations should reflect, with some degree of concreteness, the effective general state of things in the Nile Valley few generation before the beginning of the First Dynasty. It cannot be denied that these ritual object might have magical purposes, thus acting as a means to enhance royal power through depictions of victories, but it also logical to think that if such apotropaic needs were so manifest in Late Predynastic "art", this couldn't depend only on a sterile development of the ideology of power. There must have been some effective source for the tension and aggressive behaviour which emerges in the imagery of these categories of craftworks', even admitting that the message they were apt to convey was the result of a deeply meditated (planned) and averagely canonized symbolic language. Many artefacts represent violent scenarios, with more or less direct hints at battles (generally their aftermaths: prisoners rows, their punishment, humiliation or ritual killing and related triumphal ceremonies; perhaps also military raids with boats are known): cf. Battlefield, Bull, Tehenu and contemporary palettes, the Metropolitan Museum Knife handle. On a number of these fragmentary objects it can be easily observed that the representation is clearly structured as taking place in the Delta (lotus plants, Lower Egyptian Pr-Nw shrines, channels) and eventually in the Buto region (P-mat and Djebawtj heroon as towns designations on the Tehenw / Towns palette, Rekhyt + P-mat on the Plover palette; Palm + mat on the Scorpion mace-head). In many cases, standards, which have been recently demonstrated to correspond to proto-nomes entities possibly reflecting local polities or regional subdivisions of the main proto-states of that period (cf. J. Kahl, 2001 and E.M. Engel, 2006 for early occurrences of toponyms and proto-nomes in the economic sphere, i.e. on jar potmarks, tags / labels and seal impressions of Naqada IIIA1-IIID), lively act against enemies or vs. enemy emblems (in our case the Rekhyt lapwings). This is an important indication that there was some kind of alliances among Upper Egyptian regional units, although it is hard to determine the level of mutual political independence of each locality. It is generally thought that by Late Naqada IIIB only very few super regional entities, "proto-states", survived or developed along the Nile Valley. Now what does king Scorpion mace-head show and which are the possible implications of the figurative message it displays, as far as geographic and political clues? E. Baumgartel proposed that there was no need to distinct this king from Narmer; in the same way Horus Ka had been already interpreted to be possibly an indication that B9/7 was the tomb of Narmer's ka (but this is impossible for the finding of a seal impression in B7 and other reasons). Cfr. H.S. Smith in Adams - Friedman eds. 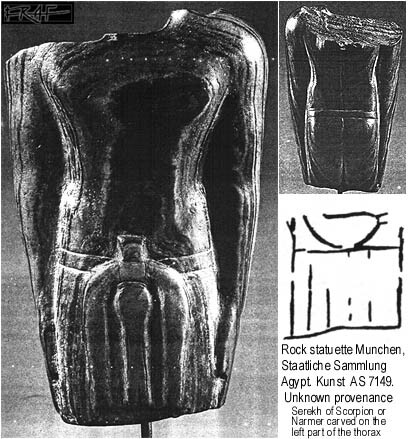 'The Followers of Horus', 1992, 244ff for the semantic value of the Rosette; but also T. Schneider in SAK 24, 1997 p. 241ff. For other Rosettes cfr. below (Qustul incense burner and MMA knife handle) but note that some more appear on Gebel Tarif, Carnarvon, Univ. College and Brooklyn Museum knife handles, Metropolitan Mus. comb). Finally also cf. A. Anselin, Le Scorpion et la Rosette: Essai de lecture des deux sémogrammes nagadéens, in: Apuntes de Egiptologia 1, 2005, 15-33. In Antiquity 37, 1963; see also B. Adams, Ancient Hierakonpolis, 1974, p.3, pl. 1, 2; K.Cialowicz, Le Tetes de Massues..., 1987 p. 41-3 fig. 5. The Macehead is in Universoty College, London inv. 14898. For another macehead in UC (inv. 14898 A) the 'Bearers Macehead' cfr. Quibell 'Hierakonpolis' I (1900) pl. XXVIA and Cialowicz op. cit. Published by W. Needler in JARCE 6, 1967, p. 87-91 pl. 1 and 2. This scorpion, with long linear claws may be compared with the sign in a serekh on a statuette in München (Staatliche Sammlung Äg. Kunst, ÄS 7149, unknown provenance, sedimentary rock, 11,2 cm high; head and legs lost; cf. Grimm, Schoske, Am Beginn der Zeit, 2000, 33, cat. 40; Donadoni-Roveri, Tiradritti, eds., Kemet, 1998, 226-227, cat. 187) which has only two very short appendices. The time span between the two monuments seems however wide. E.g. the incision on the Abu Umuri palette (see below) and others: Kaplony, in: Orientalia 34, 1965, 132ff., Pl. 19-23; id., I.A.F. ; id., Steingefasse, 1968, 13f. (crocodiles, scorpions, turtle on an alabaster vase from a privare collection). 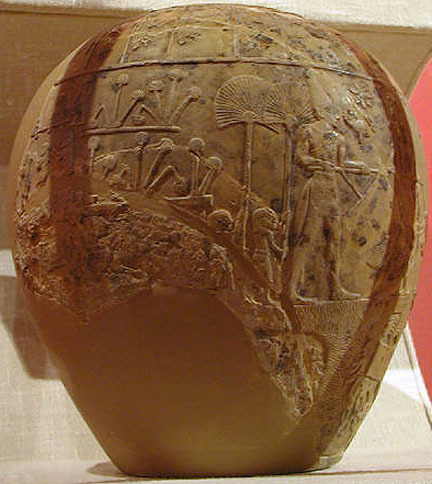 Also note that the cited limestone vessel (Quibell, Hierakonpolis I, pl. XIX,1) with Scorpions and Falcons reliefs (the latter in boats, as the god Nemty or Andjety: cf. similar motif on UC14869 ivory) has been proposed by Dreyer to be a possible indication of filiation or gift between the supposed successive (Naqada IIIa2) rulers Scorpion I and Falcon I (Umm el-Qaab, vol. 1, 173, n. 249). In an intermediate chronologic space between the early Naqada III attestations from Abydos tomb U-j and the late Naqada IIIB(-early IIIC1) Scorpion macehead, I would place the beautifully carved scorpions on the two mentioned vases from Hierakonpolis Main Deposit and on the private collection vase in Kaplony, Steingefasse, 1968, 13, nr. 2. 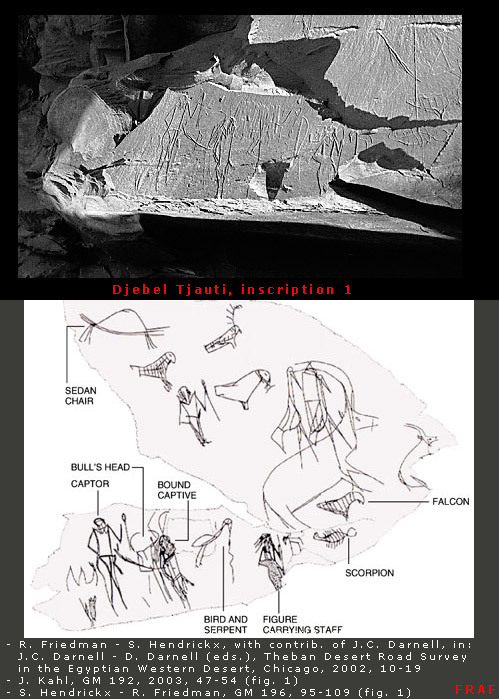 The Naqada IIIA2-IIIB datation is supported by that of similar style reliefs and paintings of scorpions from Qustul cem. L tombs (B. Williams, OINE 3, 1986, pl. 95, 96b). Other similar scorpions carved in ivory: BM 32146 (A.J. Spencer, 1980, 67, cat. 485), UC14869 (Adams, 1974, 71, cat. 364), Quibell, Hierakonpolis I, pl. XII, 2; in relief on an unprovenanced rhomboidal palette: Kaplony, Steingefasse, 1968, 17-18, nr. 4D, pl. 15; Wildung, Schoske, Entdeckungen..., 1985 (palette actually in the Japanese collection of Mr. Tadashi Kikugawa, whom I thank for the info and photos); sculpted in serpentine: Quibell, Hierakonpolis I, pl. XVIII, 15. A slightly different style is displayed in the reproduction of scorpions on late D-ware jars as the ones from Petrie's Diospolis Parva excavations (pl. XVI, 78b, 78c; the former one from Abadiyeh tomb B379 = Ashmolean Mus., Oxford E2882, J. Crowfoot-Payne cat. 918) and Berlin Mus. 15129 (from Gebelein? ; A. Scharff, Altertumer I, nr. 337; Grimm, Schoske, Am Beginn der Zeit, 2000, 25, cat. 21) which are both datable in Naqada IID2-early IIIA. A series of more stylised scorpions are found incised on vessels beside the 'reversed Ka' sign (Sekhen; this also appears paired with other animals or signs): they're interpreted by Kaplony as gifts -by unnamed kings!- upon the occasion of royal visits to the scorpion god shrines; the same author had previously hypothesised that Gardiner sign D32, Zekhen(w), would indicate a prophet of a king or deity (Kaplony, Steingefasse, 1968, 14f. ; Quibell, Hierakonpolis I, pl. 34; Adams, Ancient Hierakonpolis,1974, 44, pl. 33; Williams, Qustul, 1986, fig. 163a-c, 164a-b, pl. 80). These incised hieroglyphs (not to be ascribed in the same cathegory and purpose as potmarks) date Naqada IIIB. As it has been said, it is more probable that such scorpions represent localities, local shrines or deities (cf. Hendrickx, Huyge, Adams, Le scorpion en silex du Musée royal de Mariemont, in: Cahiers de Mariemont 28/29, 1997/1998, 7-33, esp. p. 21-23) rather than personal names. Finally the incised (sketch?) drawing on the Abu Umuri palette (see my palettes corpus) is likely early dynastic, and however hardly related with any royal name (as the three scorpions are evidently controlled and subdued to the falcon which they're tied to: it recalls other Naqada IIIB-C2 picto-logographic compositions showing animated standards or serekh smiting foreign foes). 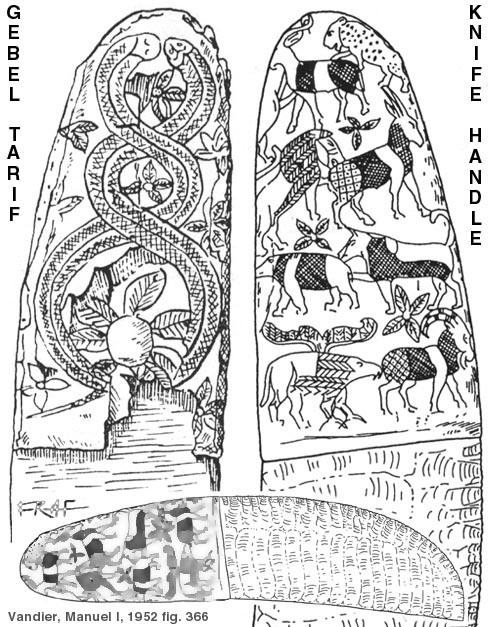 It is important to remark that the style in which animals (and objects) are rendered much depends on the material and technique adopted: in the same period a painted, incised and carved hieroglyph might have been realized with quite different results and on the other hand later production might be voluntarily realized in archaicizing fashion. Dreyer, in: MDAIK 43, 1987; id., MDAIK 46, 1990 p. 71; Hoffman, The Sciences, Jan/Feb 1988, 40-7. Wildung, Aegypten vor den Pyramiden, 1981 fig. 32; van den Brink op. cit. pl. 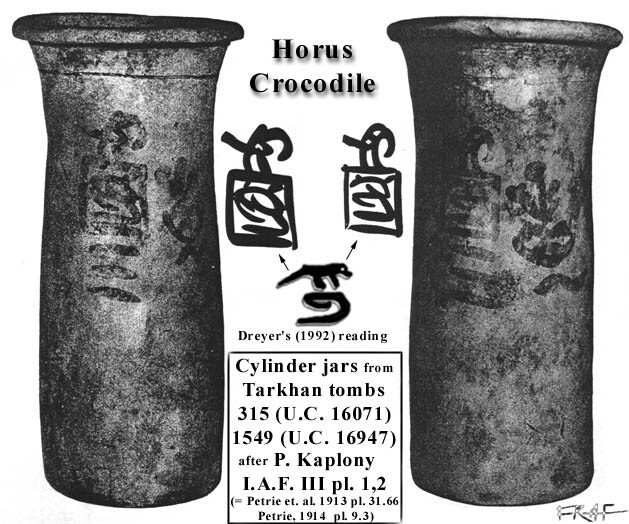 28 a,b: Horus (Crocodile -Sbk or Hmz-) the Subduer (cfr. id. op. cit. 1996 and 2001 in preparation); only B. Adams has attempted the equation of this serekh with Horus Crocodile; for Dreyer cfr. n. 35. T. 1549: Petrie, Tarkhan II, 1914, 11 and pl. 9.3; t. 315: Petrie et al. 1913, 9, 29, pl. 31.66 (wrongly reproduced as Ka) and pl. 60 (no mention of the vessel here); cfr. Kaplony I.A.F. III pl. 1, 2; id. I.A.F. II, 1090. G. Dreyer in: B. Adams - R. Friedman (eds. ), op. cit. 1992, 259ff. ; (also cf. my Dynasty 0 page, note 39). RE SCORPIONE ( 3160 a.C. ± 50 ) Sino ad alcuni anni fa la storia egiziana era fatta iniziare con il faraone unificatore di alto e basso Egitto MENES-NARMER,collocando il re Scorpione immediatamente prima, tra gli ultimi sovrani "predinastici". Oggi si preferisce collocare questi due sovrani alla fine della dinastia 0 che annovera anche Iry Hor e Ka (Orizzonte B) e la I dinastia inizia con Aha. Identificato dal geroglifico-pittogramma di uno scorpione visto dall'alto talvolta accompa- gnato da una rosetta a 6 o 7 petali, il R.S. è noto unicamente come re dell'alto Egitto; non indossa mai la corona rossa e non è attestato nel Basso Egitto come Narmer. Appare su di una nota testa calcarea di mazza proveniente da Nekhen (Hierakonpolis) ; indossa la corona bianca dell'alto Egitto,tunica,gonnellino e porta alla cintura una coda di toro; é in piedi,scalzo, con una zappa in mano che sembra servire allo scavo di un canale; alle sue spalle due uomini tengono in alto gli stendardi. Di fronte il fiore-stella a 7 punte e lo scorpione del suo nome; compare un uomo presso un palo(?) con sotto,sullo stesso piano del re,un agricoltore che volge verso il RS un cesto in cui il re getta della terra.Più in basso la parte alta di un albero di palma dentro una stuoia, un uomo con aratro ed altri due sulle rive opposte di un fiume che scavano un canale. Il resto è un insieme di scene di giubilo, danze, una parata di stendardi e 'Rekhyt' che pendono sotto ogni emblema; alcuni di questi simboli sono identici alle insegne dei futuri Nomoi dell'Egitto unificato. I pavoni egli archi appesi ai pali porta-stendardo simboleggiano le vittorie sulla coalizione di popoli del delta e sui nomadi del deserto rispettivamente(9 Archi). Benchè quindi fuori dal periodo dinastico, questo sovrano è tra i primi di cui conosciamo il nome,assieme a KA ed IRY HOR; non é raffigurato con simbolismo animale come sulle prece- denti "palette"(tori,avvoltoi) tipiche del gerzeano finale,cammina sui campi dei propri contadi- ni,scalzo,uomo come loro,benchè ritratto da eroe, la stazza esagerata volutamente al fine di ricordarne così la dignità superiore attribuitagli; facciamo notare comunque che il fatto che il re sia ritratto senza i sandali (che spesso sono portati dal funzionario addetto) può stare a sottolineare il valore e la sacralità dell'atto che compie;da quì anche l' importanza del controllo del regime delle acque nilotiche in epoca arcaica (Butzer 1976) che fa dell' irrigazione uno dei fattori cardine all' interno del sottosistema tecnologico. Al di là dell'aspetto rituale delle raffigurazioni della testa di mazza, preme quì sottolineare che questo reperto, e la parte che di esso manca, va inquadrato in un periodo in cui erano già ini- ziati gli attacchi altoegiziani contro i popoli del Basso Egitto (Naqada IIIc1) ma ancora non vi era stata l'unificazione; sappiamo che questa divenne definitiva con Narmer ed Aha ma ci si domanda anche quando cominciassero le azioni militari altoegiziane contro il Basso Egitto: Naqada IIIa2 sembra essere ancora privo di questo tipo di relazioni; il sovrano della tomba U-j ma anche i suoi immediati successori ebbero relazioni commerciali con il Delta e,di sicuro, attraverso la mediazione del Delta. Certamente, come la mitologia attesta, l' attacco dovette partire da Hieraconpolis, i cui re poi si stabilirono ad Abydo solo con la vittoria di Narmer (? ); prima di lui e di Scorpione(quest'ultimo assente ad Abydo ma,pare,già in lotta contro il Delta) ovvero nel periodo Naqada IIIb1/2, deve essere cominciata l' espansione verso Nord dei re meridionali; quanti anni prima non è dato saperlo, ma questo non è il solo mistero. Non si sa se gli scontri armati abbiano avuto un inizio improvviso e più o meno circoscrivibile in un determinato periodo oppure se si sia trattato invece di una lenta azione; in tal senso si potrebbe anche parlare di secoli di lotte prima di raggiungere l' unificazione. Quando cessarono le amichevoli relazioni commerciali e subentrarono quelle belliche e, in realtà, chi erano e di quali "capitali" erano le due fazioni contendenti? Testimonianze archeologiche che confermino quelle religioe-mitologiche(Buto e Hieraconpoli) non se ne sono invero trovate. Inoltre, nonostante i vari modelli proposti (Kemp 1989), si ignorano anche le modalità ed il periodo esatto in cui avvenne la prima ondata dei re di Hieraconpolis su Naqada e poi Abydo (le uniche ricostruzioni possibili sono per fasi ceramiche v. Kaiser in MDAIK 16 e 17 e GJ 6): non è quindi dimostrabile che i re altoegiziani si siano installati definitivamente ad Abydos pri- ma (come si presuppone di solito) o dopo aver ottenuto il successo sul Basso Egitto. Il luogo di sepoltura di R.S. sovrano non è noto; si crede debba essere Hieraconpolis ma non vi sono certezze, anche perchè gli oggetti del Deposito Principale (tempio di Nekhen) furono lì posti molti secoli dopo il periodo di R.S. Per le scarse tracce di Scorpione da Abydo v. Petrie R.T. II tav. III,19 e 'Thinitenzeit' p. 92-4. Come si vedrà oltre è stato recentemente trovato materiale su un ulteriore e più antico Re Scorpione (o Coccodrillo); l' unica cosa che resta da evidenziare è che, a parte alcune iscrizio- ni molto discutibili quanto a chiarezza (Minshat Abu Omar, Tura) ed il materiale riferibile con certezza al citato Scorpione I , il nome di questo predecessore di Narmer rimane legato unica- mente ai pochi reperti ascrittigli del deposito del Tempio di Hieraconpolis. Testimonianze di incisioni rupestri (Needler in J.A.R.C.E. 6 p.87-91) nei pressi di Wadi Halfa mostrano uno scorpione che afferra prigionieri; ma, come per i tre scorpioni incisi davanti ad un falco su una paletta da Abu Umuri, presso Nag Hammadi (Kaplony in Or. 34 p. 132-67), non si può essere certi che si riferiscano al Re Scorpione. (L' iscrizione dipinta su vaso da Tura è stata sottoposta agli infrarossi v. Kaiser in Z.A.S. 91 p.102 seg.) IRY HOR, KA (Din. 0) e Dinastia 00 Le tracce di Scorpione sono meno che tenui fuori da Hieraconpolis; E. Baumgartel pensava che lo Scorpione e la rosetta non fossero altro che titoli di Narmer, ma ciò è assai improbabile. Iscrizioni dipinte su vasi provenienti da Tarkhan contengono nel Serekh un segno corsivo molto simile al geroglifico SND che è stato interpretato come uno Scorpione o un Coccodrillo; quest' ultima ipotesi (Dreyer in 'Followers of Horus' 1992) farebbe di questo re Coccodrillo, da leggersi forse HMS o Meseh, un sovrano coevo alla Dinastia 0 ma ad essa opposto e regnante solo su parte del Delta; perciò si tratterebbe di uno degli ultimi successori di quei sovrani che sono attestati sempre da iscrizioni quasi tutte su vasi (dove i Serekh sono o privi di falco oppure con uno o due falchi sopra ed il nome o manca o è posto al loro fianco es. : Hat Hor e Ni Hor) da Tarkhan, Helwan,Tura, Minshat Abu Omar, Ezbet Tell,Beda,Abusir el Meleq,Zawyet el Aryan Tell Ibrahim Awad, Tell Iswid, Rafiah,Abu Roash,Buto-strato III-,Gebel Sheik Suleiman in alta Nubia -graffito-,deserto occidentale-graffito-, Palestina Meridionale:Tell Erani, En Basor) (Wilkinson J.E.A. 81 p.205-10; M.D.A.I.K. 38 p. 211-69;Van den Brink in Spencer A.E.E.1996). Altri predecessori di Narmer e Scorpione sono IRY HOR e KA / SEKHEN ; il primo, più antico, è attestato praticamente solo ad Abydos (tomba B1/2 Umm el Qaab) e fu scoperto da Petrie (R.T. I e II); il suo nome ,di lettura non sicura (Kaplony lo chiama WR R), è costituito da un falco le cui zampe poggiano sul segno della bocca; va notato che non tutti gli studiosi lo ritengono un nome regale : Wilkinson(J.E.A. 81 p. 243-5) pensa che si possa forse trattare di un marchio della tesoreria regia, ma comunque certamente non del nome di un re (contra Wignal in G.M. 162 p. 104-5 oltre a Kaiser e Dreyer op. cit. e Kaplony I.A.F.). Il suo probabile successore, KA (il geroglifico nel Serekh è un segno KA sempre capovolto e per questo motivo Kaplony preferiva leggerlo SEKHEN), fu sepolto sempre ad Umm el Qaab (tomba B7/9) ed è attestato anche da iscrizioni a Tarkhan ed Helwan. Questi regnanti della Dinastia 0 (Naqada III b2/c1) furono preceduti da altri re sepolti ancora ad Umm el Qaab (Abydos) nel cimitero precedente a quello B, la Necropoli U. Questa necropoli, sita a nord della B, copre tutto il periodo tra Naqada I-III a2 ; diventa un cimitero d' elite in periodo Naqada IId ed annovera la grande tomba U-j e le U-k ed U-i (Naqada IIIa2), le U-s, U-t (IIIa2-IIIb) e le U-v, U-w ed U-y (IIIb). (M.D.A.I.K. 49 p.24-56). Sembra esserci continuità tra le ultime tombe della necr. U e le prime della necr. B. Tutto ciò che sappiamo su questa fase pre-dinastia 0 proviene dal materiale recuperato dalle tombe che i tedeschi hanno scavato negli ultimi dieci anni nella necropoli U (din. 00). La tomba U-j, (meno di 50 anni dall' inaugurazione della necr. B) conteneva materiale in avorio (scettro heqa,pezzi da gioco), ossidiana, 150 vasi in argilla (W ware) ed esemplari di vasellame d' importazione cananea con un esempio di impronta di sigillo a motivi animali. La tomba è lunga più di 9 metri, quasi 10 nel lato s.e., e larga 7,15/7,25; inizialmente comprendeva la grande camera funeraria s.o. ed i 9 magazzini n.e., poi vennero aggiunte le due camere s. s.e. ; in una di qeste (11) furono rinvenute 125 etichette in osso con incisioni numerali e glifiche (quasi certamente toponimi); (piccole etichette del genere furono trovate da Petrie nella tomba di Aha, v. RT II tav. III in basso a sinistra). Anche le tombe più antiche e più recenti della U-j hanno restituito materiale interessante : serekh anonimi dipinti su vasi cilindrici (t. U-s ed U-t) ed una tavoletta con processioni di prigionieri su un lato e file di animali sull' altro (dalla tomba U-127 di fine gerzeano, N. II d). Trarre conclusioni su questo periodo non è facile ma possiamo fare delle affermazioni certe: quella fase preparatoria della civiltà dinastica 'thinita' che un tempo si credeva attuatasi nel cinquantennio circa dei regni immediatamente pre AHA (Scorpione e soprattutto Narmer),ha un periodo di incubazione molto più lungo; segni caratteristici delle "civiltà", la scrittura su tutti, che apparivano essersi sviluppati con una rapidità sconcertante rispetto ai lenti passi fatti in Mesopotamia (Uruk IV-III) vedono ora distendersi i tempi del primo sviluppo grazie alle testimonianze che la necropoli U ha fornito sul periodo Naqada II finale e III iniziale. Ancor prima dell' età di Narmer alcuni capi (regionali o sovraregionali) erano riusciti a rag- giungere posizioni ed organizzazione tali da poter stabilire traffici con l' area siropalestinese (di certo esistenti già nei periodi anteriori, Naqada I-II a sud e Maadi-Buto a nord), ad accu- mulare notevoli quantità di ricchezze e farsi costruire tombe 'monumentali' se paragonate al- le fosse della gente comune. (v. Kaiser in M.D.A.I.K. 46 p. 287-99) Alcuni simboli della regalità dinastica sono già presenti (scettro Heqa, mazze, ingenti offerte funerarie, necropoli regia elitaria, sigillatura di vasi, tavolette) e la scrittura muove i primi passi comparendo su etichette d'osso che designano località di provenienza delle merci e loro quantità; tra i glifi ci sono toponimi del delta: (Per) Udjat, (Per) Bast, Pe-Buto, segno forse che questi capi non erano ancora in lotta con i basso Egizani; le tavolette sono dirette antena- te delle più celebri di fattura tinita che sono comuni a partire da AHA (ma recentemente ne è trovato un esemplare a nome di Narmer sempre ad Umm el Qaab). Se andiamo ancora più indietro (Naqada II c) raggiungiamo i primissimi capi regionali come il proprietario della Tomba 100 a Hieraconpolis o quelli della ancora poco nota Buto (strato II), e, ad Umm el Qaab, i primi capi della necropoli U che, benchè iniziata in periodo amratiano , mostra segni di evidente gerarchizzazione solo da Naqada IId. Siamo perciò in un'età in cui questi chiefdoms stanno cominciando a percorrere la via che con- durrà alcuni di loro a dominare la scena sovraregionale in siti quali Hieraconpolis, Abydos e Naqada in Alto Egitto e, con modalità e forme che solo di recente cominciano ad emergere, a Buto, Maadi e in molti altri siti del Delta in Basso Egitto. (Helck Thinitenzeit 1987; Kaiser in Z.A.S. 91 p.86-125; Kaiser-Dreyer M.D.A.I.K. 37,38,43, 46,49,54,(Umme el Qaab); per il materiale da Buto v. bibl. in Von der Way M.D.A.I.K. 45 ).